Hydrothermal vents were discovered in 1976 by scientists from the Scripps Institution of Oceanography – a groundbreaking discovery of life where life should not exist – 2,500 meters below the surface of the sea. No sunlight penetrates to these depths, yet self-contained ecosystems have emerged here. At the bottom of the food chains are bacteria and archaea that have evolved to live on the minerals and chemical compounds gushing forth from the vents. The discovery ignited a quest to find out more about the deep sea. And just four years later – in 1980 – the next surprise came: in hydrothermal vents off the coast of Costa Rica, a five-inch worm was discovered that spends its life with its tail stuck in vent waters that reach temperatures of up to 105 degrees Celsius – temperatures previously thought to be lethal to complex life forms. 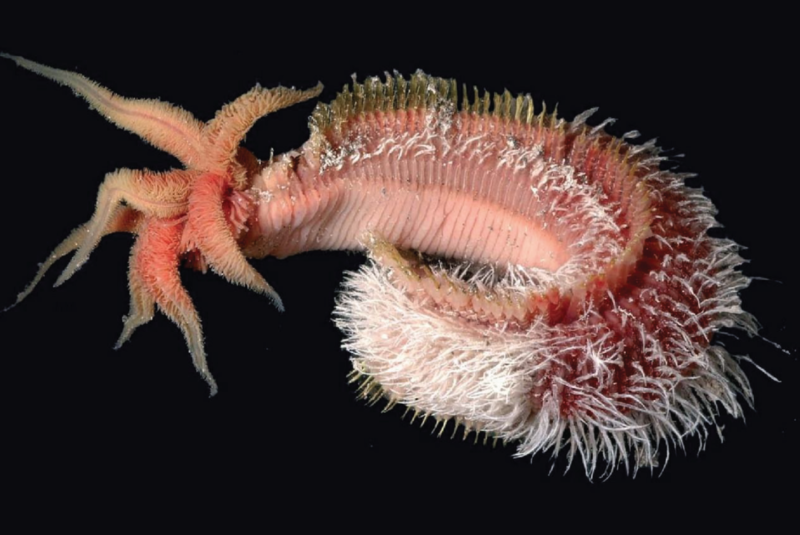 Scientists had the perfect name for these worms: Alvinella pompejana. Alvinella after the famous Alvin submersible used to discover them, and pompejana for Pompeii, the ancient Roman city that was covered in the eruption of Mount Vesuvius 1,900 years earlier. Others simply call them Pompeii worms. We still don’t know exactly how Pompeii worms survive in these environments, but it is likely related to a fuzzy coating of bacterial colonies along the length of the worm. Some form of symbiotic relationship seems to exist between these bacteria and their hosts. Organisms like these have evolved to thrive in extreme conditions, and are known as extremophiles. The genetics of extremophiles that can survive in such conditions are, well, extremely interesting. And interesting not only for researchers, but for commercial use as well. Applications include use as anti-cancer agents, painkillers, and even for synthesizing biofuels. But who is making this link between scientific discovery, the identification of valuable genetic materials, and the development of pharmaceuticals or other useful products? It’s a very expensive process, and the timelines for commercialization are uncertain (and can reach into the decades for clinical uses). At the same time, biotech research is a research frontier with potentially vast dividends. In a recently published study, colleagues and I attempted to answer a few basic questions: what marine species are the focus of commercial interest? How many genetic sequences from these species are associated with patents? Who is registering these patents? And where are these entities located? To do this, we collected over 38 million records of genetic sequences that have been associated with patents. In the database we constructed, we found 862 marine species, and 12,998 sequences from these species. The species were incredibly diverse – everything from marine microbes to iconic species like the sperm whale and manta ray. The real surprises came when we looked at who has been registering these patent sequences. One multinational corporation had registered 47% of the patent sequences – more than the other 220 companies combined. This is where the world’s largest chemical company comes into the story: BASF, with its 100,000+ employees, its network of subsidiaries and offices across 94 countries, and its investments in research and development of nearly EUR 2 billion on an annual basis. BASF’s substantial resources and core focus on innovation have made it a leader in translating marine genetic resources into useful commercial applications. But this level of dominance also raises questions of equity. Nearly two-thirds of the ocean exists beyond national jurisdiction – simultaneously belonging to everyone and no one. Should governments force corporations to share benefits from the use of marine genetic resources from these areas? This would understandably frustrate companies that are already investing vast resources in these uncertain commercialization processes. Would the outcome simply be reduced levels of innovative research and development? Best intentions could result in bad outcomes – after all, the Nagoya Protocol was adopted in 2010 to eliminate exploitative bioprospecting within national jurisdictions, but its impact is uncertain and disputed. In September 2018, this may start to change. An international treaty dealing with biodiversity in areas beyond national jurisdiction will be negotiated at the United Nations – and one of the core issues is marine genetic resources. Negotiators are left with no simple solutions, but recognize that action is needed. The ocean is seen as a dynamo for future sustainable development, and marine genetic resources are one piece of this puzzle. In our study, we found that entities headquartered in just three countries accounted for 74% of all marine gene patents, and that rises to 98% when we consider the top 10 countries. 165 countries are entirely unrepresented. Such statistics are entirely out of sync with global commitments to equity and inclusive development, including in the Sustainable Development Goals.